The Nationwide Building Society has this morning published its UK House Price data for July 2011. The Nationwide tends to be the first of the two UK building societies (the other being the Halifax) to produce house price data each month, it is one of the information sources referenced by NAMA’s Long Term Economic Value Regulation and is the source for the UK Residential key market data at the top of this page. 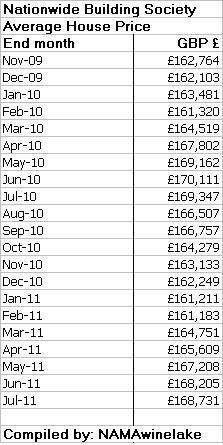 The Nationwide says that the average price of a UK home is now GBP £168,731 (compared with GBP £168,205 in May 2011 and GBP £162,764 at the end of November 2009 – 30th November, 2009 is the Valuation date chosen by NAMA by reference to which it values the Current Market Values of assets underpinning NAMA loans). Prices in the UK are now 9.3% off the peak of GBP £186,044 in October 2007. Interestingly the average house price at the end of July 2011 being GBP £168,731 (or €187,981 at GBP 1 = EUR 1.141) is 3.2% above the €182,142 implied by applying the CSO June 2011 index to the PTSB/ESRI peak prices. With the latest release from Nationwide, UK house prices have risen by 3.67% since 30th November, 2009, the date chosen by NAMA pursuant to the section 73 of the NAMA Act by reference to which Current Market Values of assets are valued. 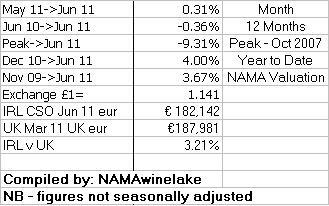 The NWL Index is now at 856 (because only an estimated 20% of NAMA property in the UK is residential and only 29% of NAMA’s property overall is in the UK) meaning that average prices of NAMA property must increase by a weighted average of 16.8% for NAMA to breakeven on a gross basis. The short-term outlook for UK residential, like the UK economy as a whole, remains bumpy. Interest rates may need to rise to contain inflation that is beginning to take hold – 4.5% in April 2011 and 4.5% in May 2011 and 4.2% in June 2011 – all on an annual basis. The UK target is 2% so the base rate which has been at 0.5% since February, 2009 may need be raised. The UK March 2011 Budget estimated growth in GDP of 1.7% and 2.5% in 2011 and 2012, though disappointing figures for Q2,2011 growth released last week of just 0.2% may bring downward pressure on these estimates. The outlook for inflation is 4-5% this year falling to 2.5% in 2012. Net debt will be 60% of GDP this year rising to 71% in 2012. Scary for the UK but paradise compared to the 100%+ in Ireland. The UK is also struggling with a deficit that was 11% last year (compared with 12% in basket-caseIreland) but there are swingeing cuts to public services in prospect to bring the deficit down to 4% by 2014/5. What all of this means for property prices is uncertain of course but the betting is that prices will come under modest pressure and may fall by less than 5% in 2011 – the Office for Budgetary Responsibility was saying 2.7% late last year but finances have deteriorated since then. The UK has plenty of micro-markets and the betting would be that London and the south-East will fare better than the North of England and elsewhere, Northern Ireland in particular.